Alado has launched the CBU Chery QQ here in Malaysia, with an on the road price of RM39,888 for the QQ model and RM41,888 for the QQR model. The Chery QQR model is basically a QQ with a sporty bodykit. The Chery QQ comes with an 812cc 12 valve 3 cylinder EFI DOHC engine, making 52hp at 6,000rpm and a max torque of 75.5 Nm between 3,500 and 4,000rpm. It comes with a 5-speed manual transmission only. Good news is the car comes with a power steering system. 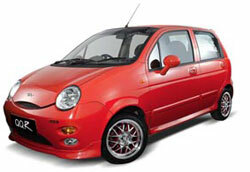 Alado intends to sell only 200 units of both the Chery QQ and Chery QQR by the end of 2006. As I previously reported, Chery also intends to assemble an MPV and an SUV here in Malaysia, the Chery B14 V5 Crossover and the Chery T11 Tiggo. While previous reports suggested they might be assembled at Oriental Assembler Sdn Bhds plant in Johor Baru, Alado group executive chairman Tan Sri Cam Soh Thiam Hong said at the QQ launch that Alado is currently in talks with a few other assemblers and Proton tops it’s list of preferred assemblers. This would be in line with Proton’s alliance talks with Chery, which would result in Proton assembling it’s vehicles at Chery’s plant in China and Chery assembling it’s vehicles in Proton’s plant here.